(left) Barbara Swagler (mother), Christopher Swagler, Scott Swagler (father) and Chamber President, John Bonora. 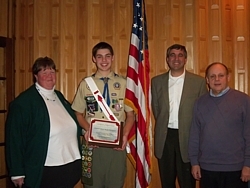 The Grand Island Chamber of Commerce Board of Directors, at its Tuesday, November 9th meeting, awarded Christopher Sean Swagler a Certificate of Appreciation on his Court of Honor as a new Eagle Scout. Board members commended him on completing the project that benefited the Town of Grand Island at Veteran�s Park. Christopher�s rank as Eagle Scout is a very prestigious rank as he earned 21 Merit Badges and put in over 180 hours of service. The information kiosk with map at Veteran�s Park is located near the snack stand and baseball diamonds. Congratulations again to Christopher and his achievements. 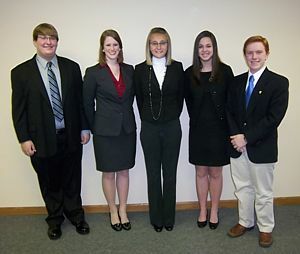 (left) Kenneth Randal (Randy) Rogoza, Kathleen Rustowicz, Sydney Dudish, Jenna Cardone and Kevin Gibas. Missing from photo is semi-finalist Amanda Heftka. The Grand Island Chamber of Commerce is proud to announce the Semi-Finalists and Finalists for its 2010-2011 Youth Ambassador Scholarship Program. They are Kenneth Randal (Randy) Rogoza, Kathleen Rustowicz, Sydney Dudish, Jenna Cardone and Kevin Gibas. Missing from photo is semi-finalist Amanda Heftka, who had an interview earlier due to sectional game in volleyball that evening. Sydney is currently a junior at Grand Island High School a member of DECA and Viking Vision News team. She has been instrumental in many activities throughout her high school years. Such as both varsity soccer and lacrosse teams a volunteer coach for Junior Vikings Cheerleading and is also a member of Young Life. Sydney is enrolled in advanced placement and honors courses, to which she plans to further her education in communications or business. She is very excited to have been chosen as one of this year�s Youth Ambassadors for Grand Island and is ready to take on the responsibilities and help build the Grand Island community. Kathleen is currently a senior at Grand Island High School, throughout her educational career she has achieved honor and high honor rolls since 6th grade, while taking advanced and honors classes, band and chorus. Last year she was accepted as a member of the National Honor Society and received her academic letter. Kathleen was honored to represent GIHS DECA at the regional and state levels last spring, placing first in the region and third in the state. She is an active member of the Donate Life Club, Interact Club, and an editor with the Venture Yearbook staff. She is very involved with her church, St. Stephen�s and the Parish Players having had roles both on and off stage. Volunteers with many organizations, PTA events, GI Fire Company, GI Foundation and GI Cooperative Nursery, just to name a few. She is honored to be chosen as this year�s Youth Ambassador and is privileged to be able to represent the students of Grand Island to show the importance of goodwill between the businesses and students of Grand Island. Silver Sponsors: Island Dental (Dr. Thomas Lepenven), Trinity United Methodist Church, First Niagara Bank, and Step-In-Time Dance Studio. Bronze Sponsors: Creative Leather Concepts/Island Shipping Center, Pritchard & Kennedy, Grand Island Moose Lodge #180, Michelle Iannello, Douglas F. Wright, DDS and Realty USA/Liz Wilbert. Island Residents have your number listed in the Grand Island Telephone Book at NO CHARGE. Would you like to have your cell number listed as well as your home number, or instead of home number? Call the Chamber office and have your information changed at no charge for the 2011 Directory coming in January 2011. Island Businesses don�t miss your chance to advertise in the Grand Island Telephone Directory! This is the first phone book all residents and businesses turn to for any type of service, product or phone number. The book is delivered to over 7600 people and businesses and a very inexpensive advertising rate. For more information contact Laura Anderson at the Chamber office (716) 773-3651. Clubs & Organizations!!! 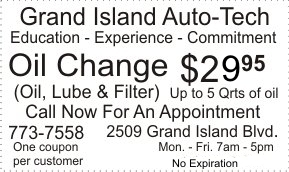 Have your information listed in the front section of the Grand Island Telephone Directory at no charge! Just submit your club or organization information to the Chamber email info@gichamber.org, address 2257 Grand Island Blvd. 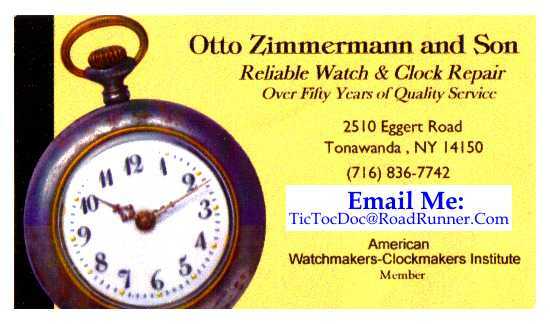 Grand Island, NY 14072 or by faxing (716) 773-3316. Selection for 2010 � 2011 Youth Ambassador Program is in progress. This program is set up to promote interaction and goodwill between local students and our business community. The program is designed to recognize the youth of this area, and to select two Youth Ambassadors who will represent Grand Island at Chamber and school functions, and community and business events as well. Now in its fourteenth year, the program is open to all Grand Island residents attending grades 10, 11, and 12 in high school on or off the Island, for the 2010-2011 school year. If you would like to sponsor this program, the cost ranges from: Platinum Sponsor $200.00, Gold Sponsor $100.00, Silver Sponsor $50.00 and Bronze Sponsor $25.00. Thank you to GOLD SPONSORS: Cannon Design, Double �D� Construction, Grand Island Central School District, Northeastern Leasing & Finance. SILVER SPONSORS: First Niagara Bank, Island Dental, PLLC, Riverside Federal Credit Union, Trinity United Methodist Church, Dr. Douglas F. Wright, DDS. BRONZE SPONSORS: Grand Island Moose Lodge #180, Michelle Iannello, Pritchard & Kennedy, and Realty USA / Liz Wilbert. The scholarship applications are available at all area schools Guidance Office and the Chamber of Commerce, 2257 Grand Island Boulevard, 773-3651. All completed applications must be submitted to the Chamber Office by Friday, October 15, 2010. (left) Chamber director and Youth Program chair, Jim Sharpe with Scholarship Award Winner Brian Kulak, his mother, Mary, and Chamber president, John Bonora. 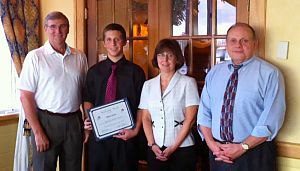 Brian Kulak was selected as this year�s recipient of the Grand Island Chamber of Commerce Annual Scholarship Award, presented at the Chamber Board of Directors Meeting on July 20, 2010. Brian was selected for his academic achievement, leadership and community involvement. Brian will attend State University of New York at Fredonia this fall with his intended major in Sound Recording Technology. Very active in athletics while attending Grand Island High School, he was a scholar athlete in soccer and lacrosse, and participated in Corporate Bowl with his team coming in 3rd place. He was also a member of jazz band and pit orchestra, and 8-time all-county musician and rookie of the year. His community activities included St. Stephen�s spaghetti dinner and rummage sale, Relay for Life, Huth Road Bazaar and volunteer musician, along with many others. Erie County Legislator Kevin Hardwick, R-Tonawanda, honored M. Scott Stallard and Susan Head, the 2009-2010 Youth Ambassador Scholarship Winners for Grand Island, during the July 8 session of the Legislature. 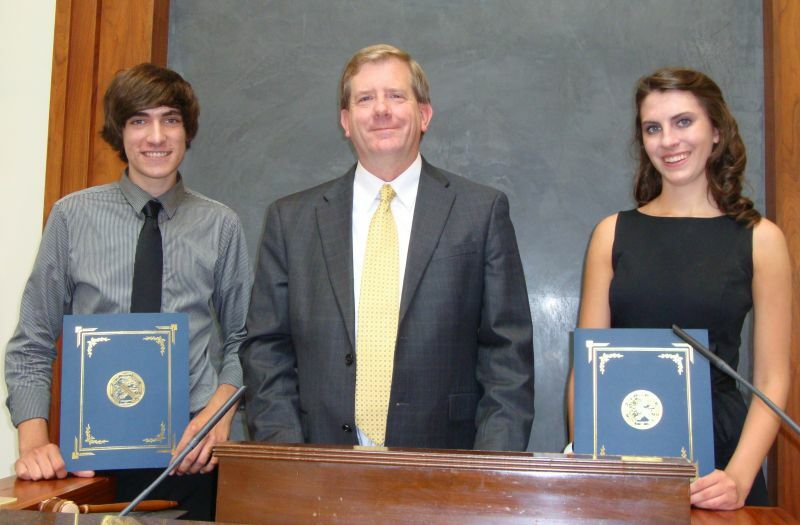 Both Ambassadors received proclamations honoring their achievements and excellent community service. The Ambassador Award is sponsored by the Grand Island Chamber of Commerce. The Grand Island Chamber of Commerce will be hosting the 14th Annual Island Happenings (Business Expo, KidBiz and Taste of Grand Island) scheduled for Saturday, June 26th, 2010 from 10 A.M. to 3 P.M. in the Town Commons off Whitehaven Road between Baseline and Grand Island Boulevard. This event is in its 14th year with the Taste of Grand Island in its 2nd year. Please join us and support your community, area youths and local businesses. Last year we had over 30 booths and 90 Grand Island students participating! This year�s sponsors are: PLATINUM � Key Bank of Grand Island and Senator Antoine Thompson, Silver � Assemblyman Sam Hoyt and Erie County Legislator Kevin Hardwick. Bronze � First Niagara Bank and Revonoc Enterprise (www.DogCrateCentral.com), Robert M. Ratajczak, Jr. P.C., People, Inc., Azzset Solar Power Systems, Emmanuel Community Bible Church, M & T Bank and Walgreens. If you are interested in the Business Expo, booths are $25.00 for Chamber members and organizations, and $50.00 for Non-members. For more information on the event please contact the Chamber office at (716) 773-3651. Your day to make money, have fun and learn how run a business. On June 26th the Park in the center of the town will be the home of your new business. The Grand Island Chamber will be your host and supporter. The people of Grand Island will be your customers. Sign up today! The 14th annual KidBiz Sidewalk Sale will be held Saturday, June 26th from 10 a.m. to 3 p.m. Training for KidBiz will be held Tuesday, June 14th from 7 p.m. to 9 p.m. at the Connor Middle School Little Theatre. Young entrepreneurs will learn various aspects of running a business. Topics such as pricing, marketing and customer service are covered at the training event. KidBiz, developed by the Small Business Development Center at Buffalo State College and Forever Elmwood, was launched in 1996. It was designed to give children in the third through eight grade the experience and excitement of running their own business. KidBiz made its debut on Grand Island in 1997 as part of the �Plaza Happening�. Last year Jim Sharpe, Beverly Kinney and Mike Heftka coordinated the event with over 110 children selling their products in the Marion Klingel Town Commons in the center of town. Articles sold included old books, toys, crafts, baked goods, and a whole lot more. The young business owners got a sense of running a business as they had to pay a fifty cent rental space fee and received a �license� to sell at the site after the rent was paid. KidBiz is an excellent opportunity for children to engage in a real-life business experience. For more information contact the Chamber office at 773-3651. 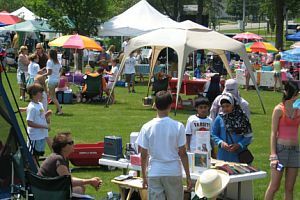 The Grand Island Chamber of Commerce will host its 14th Annual Island Happenings (Business Expo, KidBiz and Taste of Grand Island) which is scheduled for Saturday, June 26, 2010 from 10 A.M. to 3 P.M. in the Marion Klingel Town Commons off Whitehaven Road between Baseline and Grand Island Boulevard. This event is in its 14th year with the Taste of Grand Island in its 2nd year. "Please join us and support your community, area youths and local businesses. Last year we had over 30 booths and 90 Grand Island students participating!" a spokesman said this week. This year�s sponsors to date include: PLATINUM � Key Bank of Grand Island, Bronze � First Niagara Bank and Revonoc Enterprise (www.DogCrateCentral.com). Sponsor packages are available: $500.00 Platinum, $375.00 Gold, $250.00 Silver and $125.00 for Bronze. For those interested in the Business Expo, booths are $25.00 for Chamber members and $50.00 for Non-members. For more information on the event please contact the Chamber office at (716) 773-3651. Wed. 5/19/10 at 5:30 p.m. Sat. 5/22/10 at 5:30 p.m.
Wed. 5/26/10 at 5:30 p.m. Sat. 5/29/10 at 5:30 p.m.
Wed. 6/2/10 at 5:30 p.m. Sat. 6/5/10 at 5:30 p.m.
Wed. 6/9/10 at 5:30 p.m. Sat. 6/12/10 at 5:30 p.m.
For more information call the chamber office at 773-3651. The Grand Island Chamber of Commerce is proud to announce that Aceti�s Wine & Spirits (Sam Aceti), Creative Leather Concepts/Island Shipping Center (Fahim Mojawalla), Rockwood Brothers Collision (Bob & Tim Rockwood), Rose Liquor Store (Mike Hachee) and Toshiba Business Solutions (Eric Fiebelkorn) are Bronze Sponsors for the 44th annual Citizen of the Year Award. This year�s event will be held at Holiday Inn Grand Island Resort and Conference Center on Thursday, April 29th and will honor businesses and individuals whose contributions have made our town a better place. Channel 4 New Anchor Jacquie Walker will be our Master of Ceremonies. Platinum Sponsors include Grand Island Holiday Inn Resort and Conference Center, KeyBank of Grand Island and Niagara Frontier Publications. Gold Sponsors to date include HSBC Bank USA and Life Technologies. Silver Sponsor is Tops Market. Dinner tickets can be purchased at the chamber office, adults are $44.00 and children $16.00. For more information call the chamber office at 773-3651. 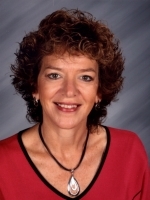 Educator of the Year Beth Boron, will be honored by the Grand Island Chamber of Commerce at the 44th annual Citizen of the Year Award Banquet. This year�s event will be held at the Holiday Inn Grand Island Resort and Conference Center on Thursday, April 29 at 6:00 p.m. Channel 4 News Anchor, Jacquie Walker will be this year�s Master of Ceremonies. Beth is currently a kindergarten teacher at Sidway Elementary School but has taught in all three elementary schools on Grand Island. She began her teaching career of 32 years in Buffalo, and after three years came back to her home town and has been teaching here ever since. Beth grew up on Grand Island and attended Huth Road Elementary, VCMS, and GIHS. It was in third grade, in Mrs. Camille Stark�s class, that she first knew she wanted to be a teacher. Beth has always loved working with children and feels that she was meant to be a teacher. She is proud to teach with such dedicated colleagues in the district that gave her such a wonderful education and feels that it is very rewarding to be in a profession that helps shape the future. Beth feels that no student is placed in her class by chance. She delights in trying to help each student be the best they can be. Beth received her undergraduate degree in Elementary Education from SUCB in 1978 and her Master Degree in Early Childhood in 1986. She has more than 30 postmasters hours, as she feels it is important to continue to learn and grow as a teacher. Boron was hired by Grand Island when the district began a 6/10-day kindergarten. She also taught split session and full day kindergarten. In between, she spent time teaching 3rd grade at Kaegebein and 4th grade at Huth. In 2003, along with special ed teacher Mary Kopf, she helped develop and then piloted the first 2nd grade inclusion class at Huth Road School. Most recently, she taught 3rd grade, and now is back where she began at Sidway. Beth was at Sidway when it closed in the early 80�s and was there again when it reopened in the 90�s. She remembers working with her colleagues as they worked tirelessly to meet the deadline of opening a new school. They even climbed in through the windows to set up the classrooms because the tile floor in the hall wasn�t set yet! Throughout her 28 years teaching on Grand Island, Beth has been involved in many school organizations, some of which are Shared Decision Making Teams, PTSA�s of all five schools, APPR Committee, Report Card Committee, numerous interview committees, Instrumental Boosters, Odyssey of the Mind, Senior Celebration Committee, and chaperone for numerous GIHS band trips. She has also written or adapted many plays, which have been performed by her students. Together with her colleagues Marge Benevento, she presented a workshop entitled �Math on the Move� at the Niagara Frontier Reading Council�s summer workshop at UB. She has also more recently been able to share her passion for teaching as a teacher mentor at Huth Road School. Beth has received numerous awards, including Who�s Who Among American Teachers, WBEN Educator of the Week, PTA Life Member, and was a two-time recipient of the Celebration of Inspiration. Beth�s involvement in the community goes beyond the school�s walls. She has been the Relay for Life team captain of Team Huth since Relay began on GI six years ago. With her amazing fellow Huth Road teachers and students, their �spirited� team has won numerous awards and in each of the past two years raised over $10,000.00! Beth also volunteers at Aids Community Services and has been a featured speaker at several events. As a lifelong member of St. Martin-in-the-Fields Episcopal Church, Beth has been actively involved for as long as she can remember. Currently she sings in the Adult Choir, directs the Youth Choir, is the musical director of the Christmas Pageant, and leads the guitar group. Beth has also served in diocesan leadership roles, including the Youth Commission and Sr. High Summer Camp Dean of Women. Outside of the classroom, Beth likes to spend time with family and friends, garden, scrapbook, read, bike and run. After raising three active children who attended GI schools, she and her husband Eric are enjoying a taste of being �empty nesters�. Their son Andy is a music teacher, and their daughters Caroline and Allison are in college. Beth credits her success and longevity as a teacher to a loving and supportive family, amazing colleagues, and a wonderful community. Other Citizen of the Year recipients include Life Technologies/Business of the Year; East Park Garden Club, Organziation of the Year; Roman �Rom� Figler II, Community Service Person of the Year, Karen Figler, Civic Person of the Year and Alexi Salamon, special achievement award. Join Channel 4 News Anchor Jacquie Walker and the Grand Island Chamber of Commerce in honoring these businesses and individuals who have made Grand Island a better place. Dinner tickets are now available ($44.00/Adult and $16.00/Children) at the chamber office, 2257 Grand Island Blvd. or by calling 773-3651.
Business Person of the Year Bonnie P. Sciuk, Brite Ideas Sales & Marketing, Inc. will be honored by the Grand Island Chamber of Commerce at the 44th annual Citizen of the Year Award Banquet. This year�s event will be held at the Holiday Inn Grand Island Resort and Conference Center on Thursday, April 29 at 6:00 p.m. Channel 4 News Anchor, Jacquie Walker will be this year�s Master of Ceremonies. Bonnie P. Sciuk is the president and owner of Brite Ideas Sales & Marketing, Inc. In 1980, she started Brite Ideas on her kitchen table then located it to one of the oldest buildings on Grand Island, which is the original Kaiser home built in 1823 on Whitehaven Road. Her company is celebrating 30 years and is known for branding companies with promotional products, design and creativity. Her company does business in many states and countries. Bonnie was the first woman to earn the New York State Governor�s award for Small Business Person of the Year. Over the years she has chaired many committees, some of which include: Director of Small Business Buffalo Chamber of Commerce, president of the Advertising Women of Buffalo, chaired Opportunity for Business Trade Show at the Buffalo Convention Center, First Chair for Relay for Life on Grand Island, and still serves on the committee, a former Board of Directors member for many years to Grand Island Chamber of Commerce. Bonnie currently serves on the Grand Island Board of Economic Development. Over the years, 40 awards have been presented to her and to her company with the most recent being the recipient of 2009 Women�s History Month Award for the State of New York. As a small business person she is a strong advocate for women in business and is a lecturer for her industry and offers assistance to others in need. 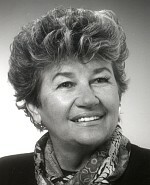 She helps fight for the democratic process by serving on the Grand Island Republican Committee, serves on the board of the American Serbian Club, is secretary of Women Interested in Cystic Health for over 30 years, volunteers for the VFW on Grand Island, and other organizations and serves on many capacities to her church. A resident of Grand Island, Bonnie and her children have four generations living here and continue to participate in any avenue they can. The Grand Island Chamber of Commerce would like to announce the selection of Alexi Salamone for the Citizen of the Year Award in the category of �Special Achievement�. Salamone was born in Briansk, Ukraine 14 months after the world's worst nuclear disaster - the meltdown of a reactor in Chernobyl in the Ukraine. As a result, Salamone was born with deformed legs and consequently, had both of them amputated at the Children's Institute of Prosthetics in Moscow when he was only four years old. He was adopted by the Salamone family and moved to the United States when he was six. Alexi Salamone, 22, got his introduction to the ice with the Skating Association for the Blind and Handicapped (S.A.B.A.H.) and soon after discovered hockey. Salamone first began skating while wearing his prosthetic legs. It wasn't until 2002 when Joe Howard, a member of the U.S. Paralympics Sled Hockey National Team, convinced Salamone to play sled hockey - without his prosthetic legs - that he really became hooked on the sport. In 2003, he qualified for the junior national team and shortly thereafter was named to the senior national team. Alexi Salamone has consistently been one of the best sled hockey players in the world. 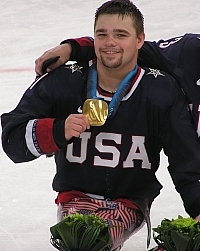 He has been a part of the bronze medal-winning U.S. teams at sled hockey's last two major international competitions - the 2006 Paralympic Winter Games in Torino, Italy, and the 2008 IPC Ice Sledge Hockey World Championships in Marlborough, MA. At the world championships, Salamone led Team USA in scoring with 10 points (2 goals, 8 assists). The U.S. Paralympic Sled Hockey Team called themselves a brotherhood, a band of 15 who have grown together as teammates, learning to love and trust one another on and off the ice. They defeated Japan to win the gold medal in the winter Games at Vancouver 2010. It was the fifth straight shutout win for Team USA during the Winter Games. It was done with the help of four players from Western New York: Adam Page, Mike Blabac, Brad Emmerson along with, Alexi Salamore, a forward and a veteran on the national team, scored the first of Team USA�s two goals. Paralympians compete at the highest level, in the same venue as the Olympic Games, but one month later. Sled hockey, like ice hockey, is played with five skaters and a goalie on each team. The players sit inches above the ice, on aluminum sleds with skateblades. Each player carries two cutoff stick blades, using the metal teeth on one end to dig into the ice and skate, while using the blade end to shoot. Salamone says the most influential people in his life are his parents, Susan and John Salamore, because they have taught him and his sister, Amelia, "to give and one day you will receive" and because they supported his desire to play hockey by attending his tournaments.  2008: Bronze medal - IPC Ice Sledge Hockey World Championships, Marlborough, Mass. The Grand Island Chamber of Commerce is proud to announce that KeyBank of Grand Island has signed on as a Platinum Sponsor, along with Grand Island Holiday Inn Resort & Conference Center and Niagara Frontier Publications for the 44th annual Citizen of the Year Award. This year�s event will be held at Holiday Inn Grand Island Resort and Conference Center on Thursday, April 29th and will honor businesses and individuals whose contributions have made our town a better place. Channel 4 New Anchor Jacquie Walker will be this year�s Master of Ceremonies. Gold Sponsors to date include Life Technologies and HSBC Bank. Silver Sponsor is Tops Market and Bronze Sponsors are Aceti�s Wine & Spirits, Creative Leather Concepts/Island Shipping Center, Rockwood Brothers Collision, Rose Liquor Store and Toshiba Business Solutions. For more information on becoming a sponsor or about the dinner please call the chamber office at 773-3651. The Grand Island Chamber of Commerce has named Roman �Rom� Figler its Civic Person of the year. The Grand Island Chamber of Commerce has named Karen Figler its Community Service Person of the year. The 44th annual Citizen of the Year Award Banquet will be held on Thursday, April 29th at the Holiday Inn Grand Island Resort and Conference Center. Channel 4 News Anchor Jacquie Walker will be Master of Ceremonies to honor businesses and individuals who have made Grand Island a better place. The Chamber invites all to honor these outstanding citizens. Dinner tickets are now available at the chamber office or by calling 773-3651. 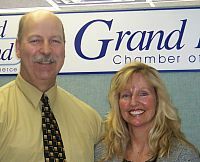 The Grand Island Chamber of Commerce has named Life Technologies its Business of the year. The Grand Island Chamber of Commerce has named the East Park Garden Club its Organization of the year. The Grand Island Chamber of Commerce is proud to announce the winners of the 2009 Citizen of the Year Award. Life Technologies will be honored as the 2009 Business of the Year. Bonnie P. Sciuk, Owner and CEO of Brite Ideas Sales & Marketing, Inc. will be awarded the Business Person of the Year and East Park Garden Club will be given the Organization of the Year Award. Karen Figler and Roman �Rom� Figler III will be recognized for their contributions to the community and will be given Community Service and Civic Person Awards, and Beth Boron, a teacher at Sidway Elementary School, will be named Educator of the Year. The Grand Island Chamber of Commerce is proud to announce that HSBC Bank and Life Technologies have signed on as Gold Sponsors along with Silver Sponsor Tops Market for the 44th annual Citizen of the Year Award. This year�s event will be held at Holiday Inn Grand Island Resort and Conference Center on Thursday, April 29th and will honor businesses and individuals whose contributions have made our town a better place. Channel 4 News Anchor Jacquie Walker will be this year�s Master of Ceremonies. Platinum Sponsors to date include Niagara Frontier Publications and Grand Island Holiday Inn Resort and Conference Center. Bronze Sponsors are Aceti�s Wine & Spirits, Creative Leather Concepts, Rockwood Brothers Collision, Rose Liquor Store and Toshiba Business Solutions. For more information call the chamber office at 773-3651. Citizen of the Year Chair Beverly Kinney and Chamber President, John Bonora pictured with Mike Samland, Branch Manager at HSBC Bank on Grand Island. Event Co-Chairs Liz Wilbert with Bryan Airey of Life Technologies. 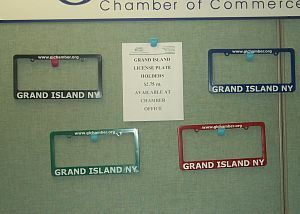 The Grand Island Chamber of Commerce announced this week that Grand Island license plate holders are in stock for purchase at the Chamber office. The holders are available for $2.75 each and come in Blue, Black, Red and Green. 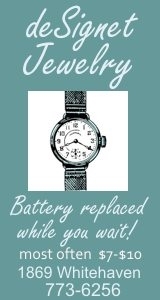 Call Laura at the Chamber office at (716) 773-3651 and get yours today. Other promotional items for sale are as follows: Grand Island Blankets ($14.00ea.) Baseball Hats ($10.00ea.) Grand Island shaped pins ($6.00ea.) Totebags ($12.00ea.) Aerial view postcards ($ .20ea.) and coming soon will be travel mugs with photos of Grand Island ($8.00ea.). See attached photo for picture of license plate holders. The Grand Island Chamber of Commerce is currently accepting nominations for the 44th annual Citizen of the Year award. Suggested categories for nomination include business, businessperson, corporation, civic, education, community service, and senior citizen. Award winners will be honored at a dinner on Thursday, April 29th at the Holiday Inn Grand Island Resort and Conference Center. Nomination forms may be found in the 2010 Grand Island Chamber of Commerce Telephone Directory, on the Chamber website, www.gichamber.org or at the Chamber office, 2257 Grand Island Blvd. Deadline for nominations is March 1st. For more information call the Chamber office at 773-3651. The Grand Island Chamber of Commerce is pleased to announce that WIVB-TV Channel 4 News Anchor, Jacquie Walker, will be Master of Ceremonies for the 44th Annual Citizen of the Year Awards Banquet. This year�s event will be held at Holiday Inn Grand Island Resort and Conference Center on Thursday, April 29th and will honor businesses and individuals whose contributions have made our town a better place. Jacquie Walker is anchor of the number one-rated News Four at 5, 6, and 11. She is currently marking her 26th year as a news anchor at WIVB-TV Channel 4, the only woman in Buffalo broadcasting who has celebrated this milestone at one television station. Jacquie�s work as a reporter has earned numerous journalism awards, Emmy nominations, and the Governor�s Award for Excellence in Communications. Her memorable assignments include reporting from the scene at the Federal Building bombing in Oklahoma City, interviewing State Supreme Court Justice Christopher Burns just after he sentenced the Bike Path Killer, anchoring eight hours of uninterrupted news coverage after the crash of Flight 3407, and covering fans at all four of the Buffalo Bills Superbowls. Jacquie has made a strong commitment to serving the community. She has been honored by many charitable organizations for her dedication, including the Leukemia and Lymphoma Society and the National Multiple Sclerosis Society. In 2009, the Buffalo Chapter of the American Association of University Women presented a college scholarship in Jacquie�s name to honor her community service. Jacquie�s husband, Mike, is an internet consultant. They are the proud parents of two young men, a sophomore at the University of Rochester and a first year student at George Mason University School of Law in Arlington, Virginia. Each year the Grand Island Chamber Commerce selects those businesses and individuals whose contributions have made Grand Island a better place to live, work or play. As volunteers in our community they have gone the extra mile, taken the extra step, above and beyond their day to day responsibilities and jobs. Volunteerism is the foundation of a good community. Our recipients are part of that foundation. Award recipients are nominated by letters from the community and selected by the Chamber's Citizen of the Year committee. Please join us in honoring this year�s awardees. The Chamber is currently accepting nominations for this year�s award. Suggested categories for nomination include business, businessperson, corporation, civic, education, community service, and senior citizen. Nomination forms may be found in the 2010 Chamber of Commerce phonebook, on the Chamber website, www.gichamber.org, or at the Chamber office, 2257 Grand Island Blvd. Deadline for nominations is March 1, 2010. For more information call the Chamber office at 773-3651. The following Executive Officers were sworn in by the Honorable Sybil Kennedy, from left to right: 1st Vice President Beverly Kinney, Treasurer Mike Trachimowicz, 2nd Vice President Diane Thompson and Secretary Dr. Sherry Bradford. 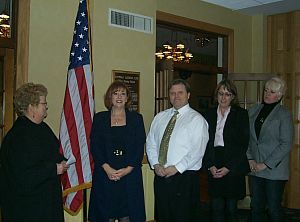 On January 19, 2009 the Grand Island Chamber of Commerce held an Installation Dinner at the Buffalo Launch Club, where the Honorable Sybil Kennedy did the swearing in of newly elected Officers and Directors. The newly elected Directors will each serve a term of three years; Sam Aceti, Aceti�s Wine & Spirits; Andy Beyer, Gross Contracting; Dawn Bonora, Mary Kay Cosmetics Beauty Consultant; Robert M. Ratajczak, Jr. P.C. with terms expiring end of 2012. Fran McMahon of McMahon�s Family Restaurant will serve out a two year term and newly elected Directors, Derek Ostrom of Ostom Enterprises and ToniMarie Antonelli of TMA & Son�s, Inc. (Adrian�s Custard & Beef) will serve out one year terms. The officers installed are as follows: Chamber President, John Bonora, FSC Securities; 1st Vice President, Beverly Kinney, Carol Ann�s Hair Fashions; 2nd Vice President, Diane Thompson, Emerson/Control Techniques; Treasurer, Mike Trachimowicz, First Niagara Bank and Secretary, Dr. Sherry Bradford of Oncology Research Therapeutics. Congratulations to all! The following Directors were sworn in by the Honorable Sybil Kennedy: Fran McMahon, McMahon�s Family Restaurant, Toni Antonelli, Adrian�s Custard & Beef, Derek Ostrom, Ostrom Enterprises, Robert M. Ratajczak, Jr., P.C., and Dawn Bonora, Mary Kay Cosmetics Beauty Consultant; Sam Aceti and Andy Beyer.